I love dosas and like it more when you can right away make them with out fermentation process. This is very old recipe from my Atte and Amma’s kitchen. They learnt it from their mothers. I am not sure as why it’s called as Uppu Menasu Dosa (Uppu means Salt and Menasu means Chilly in Kannada). Well what’s in name? It’s been my favourite dosa since as long as I can remember having it for the first name. Some what after coming here I had forgotten its existence. Yes… not anymore… Not for long time…. Soak rice in water for 1-2 hours. Add all the ingredients and grind them to smooth paste adding enough water. Heat the tava and pour a spoonful of batter and spread them evenly. Cook till it turns golden brown and crisp and turn it over. 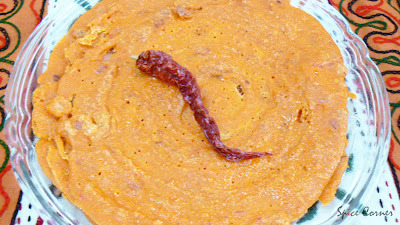 Serve hot with any chutney/yogurt or it can be eaten as it is. You can also add ½ cup of grated coconut while grinding. I’m tagged by Pooja for the MEME How my blog buddies look like. Well… it was rather difficult one as here I have to write about blog buddies whom I have never seen. I have my own vision of some blog friends with whom I interact on this virtual world of internet on almost daily basis. Although I have not met anyone of them (may never meet face to face), I have developed a very strong emotional bond with them. I think of them in terms of colours as every individual has some stong colour which portraits them. I have had never thought that I will be making so many friends here in food blogging and this is my tribute to all my blog buddies. She is mischievous and naughty to the core with streak of moodiness. She has 100 watts smile and light any place with her good sense of humour. One thing she can’t stand is sitting idle for long. Always up to something or the other. She is one pretty girl with short and silky hair. She is adventurous and fun loving person. I don’t know why I always imagine her in jeans and t-shirts. She is one busy mom with big dreams for her two little darlings. She has beautiful smile and dimple chin. I feel she is much organised and also vivacious reader. I imagine her in kid’s park playing with her little one. She is passionate about everything she does and she is a terrific cook. She can beat everyone’s record of cooking and blogging. One enthu person who has so much to give it to the world. If anyone deserves an award for enthusiastic food blogger, then I will definitely vote for her. I always visualise her as a leader rather than a follower. Intellectual person with brick sized book in her hand and her spectacles fixed on tip of her nose. She knows what she wants from her life and she is on the way of making it happen. One busy mom working in her white kitchen creating mouth watering delicacies for her family and friends. I think that she has her camera around her neck while cooking (looking at her step by step shots of cooking). She is humble and kind. It is very difficult to imagine her as she has so many ‘avtars’. Ahhh… she is one sensitive soul who cares deeply for her family and friends especially her better half. She loves to make friends and can easily mingle with any crowd. She is the one who has gone through many difficulties in her life and has emerged as a role model for others. I imagine her as a person with beautiful eyes which reflects her lovely heart. She is a doting mother who loves to bake goodies for her little princess. Her world revolves around her daughter. I feel she is a person with big dream which she has tucked away for now, but I don’t have any doubt about her achieving it one day. And one more thing, I think she has long beautiful hair. Although I have seen Seema, Soumya, Trupti, Dilip, Vani, Supriya, Manjula and Nidhi, I have not met most of them. So here is the picture I have of them. One creative lady blessed with magic touch. She can turn shambles into palace and give complex to any top interior decorator. Talkative who can talk for hours without taking any break. She has a heart of gold and a face to match. Kind hearted doctor who can never think of harming even an ant. She is a multi-tasker, able to juggle many things at once. She’d be cooking dinner and helping the kids with homework and answering the phone and keeping an ear on the radio, all at the same time. Her world revolves around her family. Proud mommy and wonderful wife cooking in her kitchen with her ‘Ginger’. She is gorgeous yet so simple. He is a lover of everything ‘hot’ and ‘spicy’. He is a doting husband who loves to cook and experiment. She is a fun loving, bindas girl who lives her life to the fullest. She has got the attitude to match her personality. Bubby and friendly and also no nonsense girl. Here comes our little master chef for whom we all are proud of. She is born with silver spoon in her ‘hand’ to create magic with food. She is a lover of everything elegant and elegance is her second name. She is an attractive girl with flawless skin and beautiful eyes. Quiet,kind hearted and fun loving. Uff... That was really difficult but it was real fun.... I quite enjoyed thinking about it. Your recipes are soo mouth watering. I love the quality of the pictures too. Thanks for such a nice and unique recipe. Try khanditha madtheeni nanu. Oops forgot to write about Meme. U got Patience aatha. Nicely written. By the way ninna India trip na bagge kelule kaitha idde innude. Hi Supriya, your uppu menasu dosa looks so delicious -- and easy with only rice -- I have to try this! Thank you for the recipe and lovely photos :) Also loved your take on fellow bloggers -- very nice! O OH!!!! forgot about the Dosa!!!!! I am always looking for fermentationless dosas!!!! I found one more!!!!! Looks cool!!! 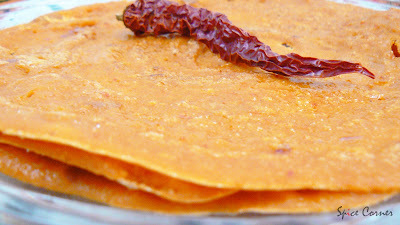 so lovely pics of Spicy dosa ! I just love it, its almost lunch time here, and I want to grab one now. Sups, I am getting bugs when I tried to log in your's, Meena,s and Mandira's!! !I tried 6 times today to get here!Phew! I love this Dosa,new to me and I will try for a quick someday. Dosai looks delicious dear,hey the best i would like is no need to wait for fermatation even.. Presentation is too girl my gal. Then regarding Meme,hey i really enjoyed reading it.You 100% correct which you guessing on me.I just wondered,how she traced out exactly. It was fun reading,you guessing on Ashaji..I imagined her as you wrote cooking in one hand..camera around her neck..Mygod!i couldn't control my laugh my dear. it must have caught bugs from ur blog asha;) i donno why its acting funny. i will see what i can do about it. uppu meNasu dose looks great. Pictures are so mouthwatering. Enjoyed reading ur imagination of blogger buddies. Good one. 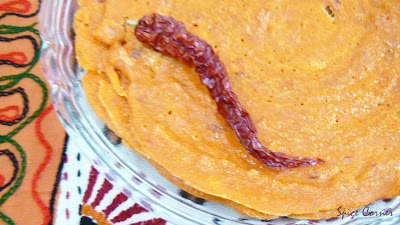 Coming to your Dosa...I have to say, it looks good! So easy too...no waiting for the batter to rise! I am so happy to read about myself in your blog and about others as well. It is so interesting to read all that. You must have burnt your mid-night oil to write about all of us. I don't know what should I say, but should I say Thank You for writing all thoses kind words for me or should I say, yes Supriya, you are right I am like that... :D So good to have a friend like you! The spicy dosa is looking mouthwatering. Anything spicy is good for me. Will try it soon. Thanks a lot once again..
Iam attracted by the colour of the dosa... they are so lovely. Enjoyed reading ur meme too..a very good imagination!!! dosa is really interesting..u got a good picture of everybody...and a lot of patience to write this..
i guess u r familier with this dosa. actually its a base for patrode with little variation in ingredients. As usual a lovely recipe and very good photographs.Dosa without fermentation, what a relief. Now I can make it at short notice.Thanx a million for sharing this recipe. Your meme is also interesting.Making a pen picture of friends whom you have never met sounds difficult.But I think you have done well. loved the mantra tunes. Can you let me know the name of the CD. Loved reading your meme. You are such an enthu girl that you wrote about all of us !!!! wow, that's awesome. you not only cook great but can read minds. but i know what you mean. in fact, wired magazine has an research project where they're trying to tell a person's personality from their online presence. and if i may be bold enough, here's my analysis of your personality from what i've read of your blog so far: you are a collector of things, you're nostalgic, you dress casually most of the time, you probably listen to jazz. would love to know if any of this is true. thanks girl:) then u r different than the image i had in my mind:) it was fun writing this MEME. thankx for all ur compliments. I did make the dosa yesterday. 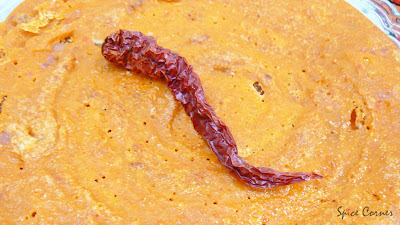 It was tasty crisp a little different in taste . But the spices compensated for the fermentation taste. We liked it.Thanx for sharing the recipe. 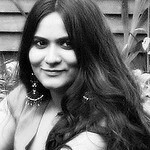 Hi Supriya,thanks for your impression of me dear.you hit the nail right non the head!I do have long hair although I can;t say it is beautiful..I try to maintain it..love long hair.